SIT SOCIETA' ITALIANA TECNOSPAZZOLE SPA, Drótkefék, wood brushes, brushes for drills, az EUROPAGES oldalakon. 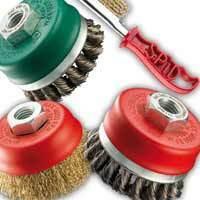 Industrial brushes for the hardware market and industry: this has been SIT Tecnospazzole's business for over 50 years. SIT is leader in the manufacture and world distribution of electric and pneumatic tools (drills, grinders, sweepers, etc). SIT manufactures crimped wire and twisted grouped wire brushes for pipelines, cleaning of weld seams, burrs and finishes for all types of surfaces. We export our ''Made in Italy'' quality worldwide.